Mobile technology is changing the way government interacts with the public anytime and anywhere. mGovernment is the evolution of eGovernment. Like the evolution of web applications, mobile applications require a process transformation, and not by simply creating wrappers to mobile-enable existing web applications. 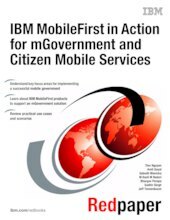 This IBM® Redpaper™ publication explains what the key focus areas are for implementing a successful mobile government, how to address these focus areas with capabilities from IBM MobileFirst™ enterprise software, and what guidance and preferred practices to offer the IT practitioner in the public sector. This paper explains the key focus areas specific to governments and public sector clients worldwide in terms of enterprise mobility and describes the typical reference architecture for the adoption and implementation of mobile government solutions. This paper provides practical examples through typical use cases and usage scenarios for using the capabilities of the IBM MobileFirst products in the overall solution and provides guidance, preferred practices, and lessons learned to IT consultants and architects working in public sector engagements.